If you think I’m crazy with all my talk about improv being just like real life and all, you’re not alone. And we won’t even mention the bunnies. But if you DON’T think I’m crazy, hold on a sec. I’ll convince you. Yesterday my computer died. Well, technically it’s not dead. It’s in critical but stable condition in ICU and there’s a good chance it will make a partial recovery. In any event, my beloved Mac is taking a few days off. Which means, basically, I’m taking a few days off. Alert readers will realize that since I’m writing this blog, I must a) have some other computer access, b) possess magical abilities and/or c) bunnies. One or more of those is true, so I am able to do some basic computer tasks like visit FB and upload blog posts. I can’t do the majority of what I do, however, and that’s where improv comes in. I could sit and fret about the work that’s not getting done. I could project into next week, thinking about how busy I’m going to be when I get the computer up and running and have this big backlog to catch up with. I could blame others, like Apple or Andy Co-Dependent or bunnies, and not take responsibility for the fact that I tried to cram too much crap on my hard drive. I could throw out random information about unicorns. But I learned stuff in improv that helps me deal with the unexpected – and sometimes unwanted – bits of excitement life throws at me. First of all, I accept it. Like agreeing with whatever label my scene partner gives me… I may not like it, but I accept it and don’t go into denial mode. Second, I don’t panic. The best way I know to NOT panic is to stay in the moment. The reason people typically panic is because they let their mind take them to the worst-case-scenario place, and that, by definition, is almost never good. So stay in the moment and just deal with this… thing… right… now… And third, I trust. In improv, you have to trust yourself and your scene partner. Same is true in life. So my Mac is wonky. It’s okay. Fortunately the work I have to do is not going to affect the debt ceiling one way or the other, or the unicorns or the cure for cancer. I’ll just think about today and do the stuff I can do and trust that this, like everything, happened for a reason and if I stay in the moment there’s a good chance I’ll figure out what that reason is. Luckily, these are skills anyone can learn! Even luckier, we are happy to teach them to you. Held2gether classes are starting all the time, and there’s even a 1/2-Day Intro to Improv Workshop coming up on August 14th. And don’t worry, improv class won’t make you crazy. I was nuts long before I started taking improv. I was informed that yesterday’s post was a bit heady, which can happen sometimes on a Monday. But anyway, my apologies. My goal is not to make anyone think. So today I’m just going to talk about bunnies. No, really. Shortly after Easter a couple of bunnies appeared in my ‘hood. One black and white, the other all gray. Both with fluffy white cottontails. Apparently Easter gifts gone awry, someone had released them into the wild to fend for themselves. The whole neighborhood adopted them, checking on them and asking other neighbors if a couple days went by without a bunny sighting. Enough time has passed now that we’re fairly certain they are the same gender, otherwise there’d be 50 bunnies by now instead of just the two. The thing is, my neighborhood really is the wild. We have coyotes and raccoons and possums and hawks. So we all know the bunnies’ days are numbered. But they are having happy, carefree bunny lives in the meantime. This has absolutely nothing to do with Held2gether improv. But it also didn’t make you think. You’re welcome. I’ve been thinking again, and you know what that means: headaches for me and strange new improv analogies for you. You’re welcome. Lately I’ve been hung up on the idea that improv is like sports. Not with the sweat and the beer and the rowdy fans. But in many other ways, they are practically identical. If you want to get good at a sport, you have to practice. A lot. I was on the swim team in high school, and I had to practice for three hours, five days a week. I didn’t even want to get good, and I looked like one of those East German swimmers from the 1976 Olympics, and my hair was trashed, and I’ve forgotten my point. Oh, right, practice. Improv is hard, people. Doing it for two hours a week is enough to learn the fundamentals and play a variety of different games and meet cool people and get hooked on improv. It’s not enough to get you on SNL. Do you really think Michael Jordan would’ve made it to the NBA if all through high school he shot hoops for just two hours a week? Yeah, I don’t think so either. Another sports analogy: playing by the rules is key. When you and your pals get together for a pick-up game, you don’t all play by your own rules. You play by the rules of the game. It would be dangerous for players and annoying as hell for spectators if athletes all just did whatever they wanted, whenever they wanted. Playing by the rules is what makes a sport fair, understandable and enjoyable. Same with improv. It’s important to start with the Held2gether Intro to Improv Comedy class because that’s where you learn the rules. While the different improv schools and styles share certain commonalities, like agreement and commitment, they all have different rules that they play by. Just because you know the rules of baseball doesn’t mean you know the rules of football, and vice versa. H2G has its rules, and you’ll only learn them in H2G’s Intro class. And finally, mastering the basics. From kids playing city-league t-ball to the pros, athletes are always practicing the fundamentals. Batting practice, running routes, doing layups – doing drills over and over helps you improve and keeps you in shape. In improv, people are often eager to move “up” to the next level of classes. But mastering the basics takes time. And even when you do advance, it’s a good idea to periodically take an Intro class, or a 1/2-day Intro workshop, just to brush up on the fundamentals. Just think of it as improv batting practice. Oh, and I lied about the sweat and the beer and the rowdy fans. Those all apply in improv as well. OMG! 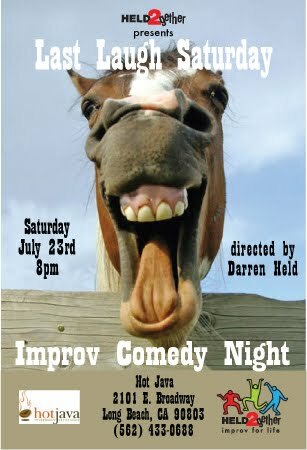 It’s time for Held2gether presents Last Laugh Saturday tomorrow night at Hot Java in the LBC. And if you like us, or this blog, or me, or improv in general or, you know, other stuff, could you click here and like our Facebook page? That’d be awesome, thanks! I’ve been having a bit of a meltdown lately, what with my confidence being in the toilet and my whininess being at an all time high and all. Lisa called me “Miss Negativity-pants,” which sums it up pretty well. I apologize to my improv teammates for being such a downer the past couple of weeks. Months, whatever. The point is, I apologize. Oh yeah, fair warning. This post is all about me. But last night I got my groove back. Now I know how Stella felt. Minus Taye Diggs, of course. I mean, improv is magical but it’s not that magical. Anyhoo. I was back in the improv zone, giving my scene partners decent info to work with and not fumbling everything they passed to me. What happened between last week and this week to snap me out of my funk? Well, aside from a whole lot of Buddhist talk, I decided to snap out of it. And then I decided not to feel sorry for myself because I can’t do stuff. And then I remembered a saying I learned many years ago, “If you argue in favor of your limitations, you get to keep them.” So then I decided not to insist that I can’t do stuff. The deciding and remembering were good, but I also needed to take action. So then, finally, I asked a troupe-mate for help. Naturally, he said yes. That’s how it is with Held2gether troupe people: we all know we’re a team. We’re on the same side, which means we’re all on each other’s side. If I get better, it makes the whole team better, so why wouldn’t my teammates help? So even though we haven’t started my tutoring sessions yet, the fact that I took the actions I needed to take to snap me out of my funk and get over my limitations have already helped. Of course I still need to follow through on the tutoring; I am still remedial in certain areas. But I’m no longer Miss Negativity-pants, and that’s a good start.